Yeah we know, riding a bike while whacking a ball into a goal sounds crazy. And it is. Crazy fun! 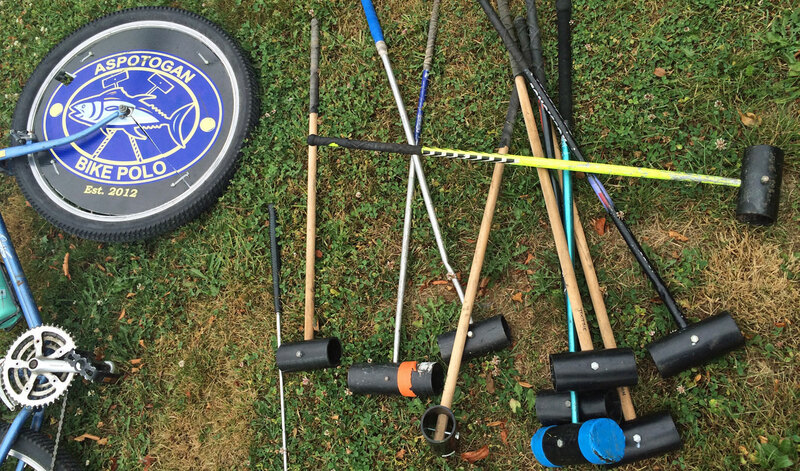 You only need to try it once to know that bike polo will be your new passion. Every game delivers something different-a little piece of magic that you couldn't have imagined. Bike polo has been around for over a hundred years, but our local game started in the spring of 2012. It was the lunchtime activity at the Nova Scotia cycling summit, and one of the participants decided that we couldn't give it up. Three years later it's still going strong with a committed core of about ten players (men and women), and new faces that show up every week when they're visiting the area. There's a few rules to keep the game safe, and we keep them simple to foster friendliness and fair play. You're welcome to join us anytime to try it out. Because it's new to everyone there is no great expectations about proficiency. Even those of us who have been playing for a while are often humbled, and we are not so far removed from our very first game that we forget what it's like to be a beginner. Bring a bike and a helmet and we can supply the rest. If you don't have a bike that you're willing to use (accidents do happen) let us know and we can arrange a loaner. If you're curious but can't make it to Mill Cove, let us know, we'd love to help start other groups around the province. Hours Thursday evenings (May-November), and Sunday afternoons (year round as long as there isn't too much snow on the field). Times vary with the sun, but typically Thursdays at 6:30 and Sundays at 3:00.